Lambert owns the trucking line that ships cattle to market. When he raises his rates Roy decides to ship the cattle on the River Boat. When Lambert and his men are unable to stop the boat, they rustle the cattle. Don José Vargas: Here they come, these Americanos and their covered wagons. Pedro, the days of the Dons are numbered. In Old Caliente operates under the paradigm that persons of mixed racial origins are not to be generally trusted. Many a remark is passed about villain Jack LaRue and that he is what he is as a result of his parentage. LaRue is the villain in this Roy Rogers western and while he courts Katharine DeMille daughter of Spanish landowner Frank Puglia in the early days of California statehood, LaRue is also acting as an inside man for a gang of outlaws headed by perennial western villain Harry Woods. Roy works for the Don and he's busy courting Lynne Roberts who came west in a wagon train guided by Gabby Hayes whom she calls Uncle Gabby. LaRue murders Puglia and pins the blame on Roy and Gabby. But we know that in the end the truth will be revealed. One thing I did like about this western was the manner in which Roy was paid for the Don's cattle on completion of the cattle drive in this film. The reason for the payment in the unusual form it takes was to foil the outlaws. It works too, I can't say more, you have to see it to believe it. 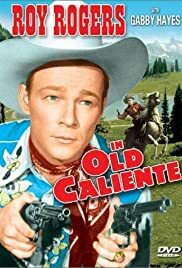 Other than the racist premise which seems to underline In Old Caliente the film is an enjoyable Roy Rogers western.